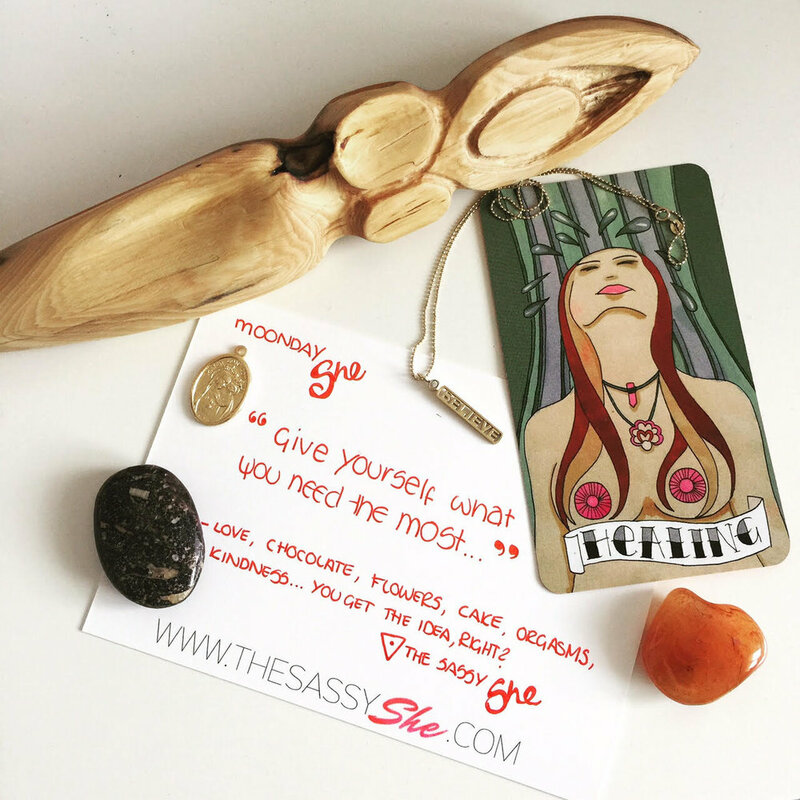 Ahhh, by showing you HEALING from the SASSY SHE Oracle Cards SHE is asking you to ‘be the one who gives yourself what you need the most.’ Self-care is not an indulgence, it’s necessary, because it’s in these moments of showing yourself love, compassion, pleasure (add your own need right here) that deep healing can occur. For you, for the women that have gone before you, and for the entirety o’ ladykind. Self-care is not an indulgence, it’s necessary, because it’s in these moments of showing yourself love, compassion, pleasure (add your own need right here) that deep healing can occur. We spend so much time looking outside ourselves for validation, waiting to be saved, waiting to be loved and that can feel good when we receive it, but when you are your own knight-ess in shining armour, when you save yourself, when you validate yourself by believing wholeheartedly in YOU, the ‘I’m not enough’ wound that sits in the heart of so many of us, starts to slowly heal. And when THIS healing occurs? The big ma heals, communities grow + possibilities become manifest. Jai ma! What can you give yourself? What do you need the most right now? Please share! Our Mary Of Perpetual Help token – giving yourself what you need the most, doesn’t mean you have to do it alone, OMOPH reminds us that if we need help – childcare so we can sleep for a few hours for example – don’t be afraid to ask. Believe – this beautiful gift from my friend + guide-ess Elena Brower, is a reminder to believe in yourself + to believe in possibility – this is the very best kind o’ healing. Carnelian – use this stone to balance your body energies + bring you back to centre.